Motherwell manager Mark McGhee awoke in the middle of the night with the "ugly" formation in his mind that could have consigned Dundee United to relegation. McGhee feels the changes to his side were needed to secure the 3-0 win that leaves the Terrors 13 points adrift at the foot of the Scottish Premiership. "I woke the other night at four in the morning as I had been thinking about it," he told BBC Scotland. "It will get football stopped. It's ugly." McGhee's idea was to not only replicate United's formation but the work-rate from a team desperate to narrow the gap at the foot of the table. "I sent my assistant, Steve Robinson, a text at four in the morning saying 3-4-1-2 and we started discussing it and, by the time we got to work, we knew what we wanted," he said. "I don't know any team that I've managed that have played like that before, but that's the way we had to be. "We have over-played at times. We knew how they would play, the pressure they would put us under in terms of returning the ball and we decided to match it. "We set out to do a job and I thought we did it very, very well." 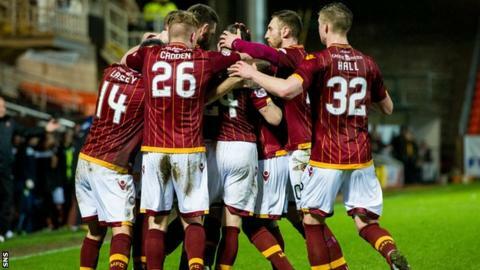 Motherwell had started the night in second-bottom place and victory lifted them to eighth, but McGhee stressed that his side were still involved in a battle to avoid relegation. "It's three points towards the total we are trying to achieve and we're just thrilled with that," he said. "I will sleep well tonight for the first time, I can assure you, in several days." McGhee thought that Stephen McManus' opening goal in first-half stoppage time was vital. "We got a goal just before half-time, which was a great time to score, as it put them on the back foot and gave us a lift," he said. "If they had got to half time, coming back down the hill, it might have put us under pressure." Downbeat United manager Mixu Paatelainen admitted that it would be difficult for his side to now escape the drop. "I am disappointed to have lost that game because I never anticipated that," he said. "I thought we had plenty to worry them, but today we were very flat and that performance was not acceptable," he said. "We just concentrate on Saturday's match and doing our best, but it is a really long road." Paatelainen thought his side could have got back into the game before Scott McDonald's two goals in the final 20 minutes. "The first goal is always important, but after that we had chances," he said. "They were clear-cut chances and if you don't take big chances and, if you are not good enough, you are not good enough. "The first two goals were set-pieces and it's cost us. It's been the story of the season conceding goals like that and it's simply not good enough."